With rumours of rain at Mokpo on Sunday I was looking forward to the Korean Grand Prix this weekend. Alas the rain did not show, and 24 cars lined up on the grid ready for action. Vettel got off the line extremely well, closely followed by Hamilton. Behind them chaos ensued when Massa spun off the track, bumping his teammate Alonso who luckily escaped with minor damage to his car. Vettel pulled away with lighting speed and opened the gap by two seconds after the first lap. The German once again seemed at one with his Red Bull and we hardly saw any coverage of the leader for the rest of the race. Everything seemed relatively calm and I was left wondering if Korea was going to be another one of those ‘meh’ races, like so many before it this year. That is until lap 31 rolled around. Here’s where all the action starts. Sergio Perez locked up his front right tyre in Turn 1 on lap 31 which caused it to explode, sending bits of tyre belt all over the track. Luckily the flying rubber didn’t hit any of the cars behind. Unfortunately Webber’s bad luck continued and he ran over the debris which caused a puncture – and the Aussie was back in the pits for a third time. However it didn’t stop there for the poor guy. Having fallen back in the race as a result of his puncture, he was shunted by Adrian Sutil. The oil radiator and KERS caught fire and soon the Red Bull was engulfed in flames. Webber exited the car unharmed, which is more than we can say for the Red Bull. There was some great racing between Hulkenberg, Hamilton and Alonso, who were fighting for P4, 5 and 6. Lewis was ever so charming again with his team radio messages, at one stage asking ‘Does anyone have any suggestions’ when referring how to pass Hulkenberg. That left me with a good chuckle. With a clear indication from team Lotus that Romain and Kimi should go racing, there was no love loss between the two who where battling it out for P2 and 3. I personally can’t wait to see Kimi at Ferrari next year, as I doubt there will be any team orders there either. Should make for a lot of fun between him and Alonso. Amongst all the chaos of the last 20 laps there was one driver who for me personally stood out. That recognition goes to ‘the Hulk’, aka Nico Hulkenberg. The German in the Sauber did wonders to fight off Lewis Hamilton and really showed his racing star quality, finishing in P4 – Sauber’s highest finish this year. I do hope he gets a good seat next year, fingers crossed that Lotus picks him up. 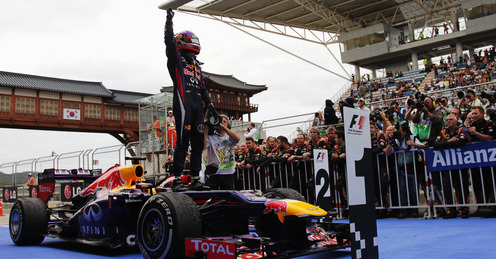 Vettel once again had the race under control – I just can’t get over how amazing he is. I look forward to the day he clinches his 4th world championship, he deserves it. As a side note I have to mention Paul Di Resta’s crash on lap 26. This man is one of the most overrated drives in F1 for me, with this being the Brit’s 4th consecutive DNF as a result of him binning it. Totally average if you ask me. Back to back races this week – looking forward to Suzuka next week!